Exchanging OUR Vanity For HIS Victory..
Our struggles with achieving a healthy balance in areas of our life is impossible without filtering everything we do through GOD’S WORD. However, one of the most talked about and most controversial, is our struggles with our self-image. Our culture and our media have aided in skewing our perception of a healthy body image, what true beauty really is, and the motives behind taking care of ourselves. Our reflection in the mirror has become the only indicator of our over-all health in America, and our beauty is being measured by a standard of a beautiful face on the issue of the latest fashion magazine. This breaks my heart, and most certainly breaks the heart of God and cause Jesus to weep. Has our reflection in the mirror become our God? We spend every moment of our freedom, or rest, obsessing over ways to get skinnier, look younger, get a tighter body, going in debt for surgically enhanced bodies that measure up to a standard that really doesn’t even exist. It is impossible to gain something that isn’t really obtainable in the first place. It’s a tool of deception and used to kidnap and take hostage true beauty which Jesus already paid for in full. Because since the beginning of time we have wanted what we “cannot” have. The enemy of our soul has convinced not only the lost, but also the children of God, that our CREATOR is holding back on us; and that there is so much more for us then what He has provided in paradise. That’s right we are in the middle of “PARADISE” created specifically for humanity and we want more? Yep, that sounds about right, doesn’t it? In Genesis, EVE “saw” that the fruit was good for food and it was “pretty” to look upon; and though it was the only thing not allowed for food she “HAD TO HAVE” it, or she would die. SO WILL WE, if we do not stop placing value on the outward appearance of our own reflections and outward traits of beauty. We will never be more valuable than we were when God created us in HIS own image. We will never be more beautiful to our Creator because He fashioned us with HIS own hands and breathed life into our very being. WHAT ARE YOU DOING WITH WHAT GOD GAVE YOU? HAVE YOU REALLY GIVEN EVERY PART OF YOURSELF TO GOD? HOW CAN YOU HELP GOD TO PRESERVE YOUR BODY WHILE YOU ARE ALIVE? IF PART OF YOUR BODY WAS INFECTED WOULD YOU JUST WATCH IT DECAY AND DIE? The truth is you are living in your body on loan from God. He has put you in charge of taking care of what really belongs to HIM. Therefore, be honest in your evaluations of your management skills as it relates to your body and HIS TEMPLE. Your physical health is a vital part of making your life count. Health is essential to fulfilling your divine purpose and living out the full number of your days God has allotted for each of us. Every day is a gift from God and not one should be wasted. If you’re believing the lies the media and the world are selling you, then you will ultimately fail. Why? Because It is all VANITY, and pride comes before the fall. We are all guilty of being led by our vanity at one point or another, but we can begin to make a difference one person at a time if we are willing to embrace the truth of who we are in Christ and silence the voices in the mirror of the world. However, give grace to yourself and others, and begin to gently lead others out of the darkness into the light so they too can see how beautiful they really are!!! Don’t love the wold’s ways. Don’t love the world’s goods. Love of the world’s way squeezes out the love of The Father. Practically everything that goes on in the world…wanting and wanting. Wanting everything you lust for isolates you from HIM. We don’t want to isolate ourselves from Our God. On the contrary, we want to do our part to crucify the flesh that tries to separate us from our loving Father who calls us HIS OWN, so that we will dwell in HIS constant presence. Please join me in this simple prayer. Please forgive me for making beauty about me and how I look; or even how the world view me. It’s all about you and what YOU have done for me to live a “LIFE OF BEAUTY” and not a “LIFE THROUGH BEAUTY”! Protect my children and grandchildren to the deception I have embraced as truth. Let it start with me and break the cycle of vanity of self. Instead help me live for YOU, the full number of days in the body you created especially for me to thrive in and overcome the schemes of the enemy. I surrender my own desires, my vanity, and my ideas that do not line up with YOUR WORD! So, Lord today I choose to lay down my pride, EXCHANGE VANITY for VICTORY; and to walk in truth from this day forward. Your children walking in truth brings you no greater joy! May I forever be a child that brings joy to the heart of my Father and not tears to the eyes of my Savior! Don’t Like the Vibe…Then Change It! ARE We Helpless In Our Battles? Do we have the weapons to overcome our struggles, our circumstances, or life altering interruptions? The truth is, WE DON’T! But we have a Father in Heaven who does; and His Spirit lives and abides in the heart of every believer. Yet we lay battered and wounded along the edges of battle’s wake. Why? When we release God’s Word and His presence into the atmosphere we are profess the goodness and power of our Creator. Are we brave and courageous enough to overcome the circumstances that keep us paralyzed instead of powerful? I have learned as an intercessor, releasing God’s Word into the atmosphere causes change in the spirit realm that can profoundly impact the physical world around us. Even though we can’t see it, we know that God takes words spoken in prayer to HIM in faith and gives them power by HIS Spirit as He releases the answers and returns them to earth without void. I have been told by some, realistically, I can’t speak anything into existence, but rather, instructed to wait in faith upon God’s provision. And sometimes this is true. However, God would not instruct us to put on His armor if there were not a real possibility of confronting the enemy. Would it not be less risky and require less faith to sit in safety beneath His wings? After all, HE IS GOD! Then perhaps God’s purpose for the armor is because confrontation with the enemy was imminent in battle and our faith in His Word would protect us, if we have the courage to believe. Therefore, is the approval of others robbing us from exercising God’s word that He has hidden in your heart to overcome the battles in this life? Many of God’s children have fallen for the deception of well meaning people who are only trying to keep us from getting our hopes us right? OUR HOPES UP…you’re kidding me? As a believer and spirit filled child of God I need all the hope building I can get and that’s the TRUTH! But I can only get that from God’s word and not man. Then why does God tell us, “your words hold the power of life or death” choose life! Confused? Well you are not alone. Very few professed christians really believe their words matter, let alone have the power to change, cause or effect anything in this world! Well let’s take a look at what God’s Word has to say about that! David confronts his mighty enemy with confident words rooted in what he knew OF God and not his own abilities. He spoke words that seemed boastful, even among great warriors today. Does his words seem unrealistic or foolish to us today? Probably! Nonetheless, the young boy’s courage leaves me with hope and a beautiful picture of the power our words can have when spoken in faith upon God and His ability to bring something into existence and not by our own strength or wisdom. I challenge you today to dig deeper into God’s Word to find stories like David’s that will encourage you in the middle of your circumstance. Then with faith and without doubting; begin to proclaim aloud God’s Word And the promise within. If He can use a young lad to slew a giant in front of the enemy’s camp so the whole world would know there is a God who saves. He can, and will do it again for you beloved Saint of God. Just have the courage to believe He can! Remember the battle is the Lord’s; and He will give over into your hands all your enemies! No not every word we speak comes to life, however, if the words we are speaking are rooted in His Word, His Truth, and His Will, then perhaps our battles would be won more often then not. Probably the most misunderstood issue surrounding this subject is the misuse of the above scriptures. God is sovereign and no one can fully understand the cause and effect of things that happen. Sin and the fallen state of mankind is a huge factor, but God is not limited by our sin! As a matter of fact He died to cover and pay for our sinful nature, but don’t confuse the two. As believers, we are still in our decaying bodies for now, but have been cleansed from all unrighteousness. We are now children of God and have all His resources at our disposal. So then, we do not live and act as the world, nor do we fight as the world does. We have an arsenal of heavenly power, and none more powerful then the Word of God Himself. So brothers and sisters, why sit idle and speak hopelessly like we are powerless when we have the power to give life to our dying situations, the things that bind us to this world, and the clutches of the enemy? Today, I pray you will see who you ARE IN CHRIST and who God has called you to be. Victors, Kings and Priest in a royal army…THE ARMY OF GOD! Lord give wisdom and boldness to your children so they may walk in the confidence and truth of your Word and not their own power and strength. Holy Spirit teach us the ways of God, so that we may not sin of course, but also that we may honor our Father in Heaven by acknowledging the finished work on the cross and the blood of Your Son by speaking your word into a lost and dying world. Bless them O’ Lord and meet them where they are, because where they are is where you have them. We give you all honor, glory and praise! On my knees in prayer for you TODAY! Jesus is saying, “THERE IS HYPOCRISY IN THE LAND AND I HAVE THE ANSWER!” Come, listen, And hear why this is so serious; AND why Jesus considers it the most dangerous sin a christian can commit before God. Why is this issue so important Jesus sternly warns the Pharisee of their spreading hypocrisy? Could it be because Jesus knew the serious effects of hypocrisy and the danger it poses to His people if left to take root in the heart of a believer. So it would seem that hypocrisy would be in direct opposition to the life christian (or little christ); and therefore, should not only concern Jesus but you and I as well. SIN OF HYPOCRISY is the worse type of sin a child of God could commit. Why? REASON 1: It drives the unbeliever AWAY from God’s presence instead of drawing them to Him, and His saving GRACE! And usually my standard answer is, “yeah, but there are hypocrites in every church.” Has this become acceptable in the Body of Christ? Have we become so callous to the words we hear we no longer grief at the utterance of these statements flowing out of our own mouths? Something needs to change NOW! As Christians we have a responsibility to portray Jesus, and not just the parts of Him we choose, but ALL OF HIM. REASON 2: It desensitizes the heart of the believer to the danger of hypocrisy and slowly we begin to call it acceptable. If hypocrisy is virtually the opposite of truth, then it would stand to reason, this particular sin sets itself up as an enemy of God; and has the potential to produce fruit that is poisonous to everyone. In Luke Chapter 11: The 6 Woes because of hypocrisy. Woe to you Pharisees, because you give God a tenth of your mint, rue and all other kinds of garden herbs, but you neglect justice and the love of God. You have practiced the latter without leaving the former undone. Woe to you Pharisees, because you are like unmarked graves, which men walk over without knowing it. Woe to you You experts in the LAW, because you load people down with burdens they can hardly carry and you yourselves will not lift one finger to help them. Woe to you, because you build tombs for the prophets, and it was your forefathers who killed them. So you testify that you approve of what your forefathers did; they killed the prophets and you build their tomb. Woe to you You experts of the LAW, because you have taken away the key to knowledge. You yourselves have not entered, and you have hindered those who were entering. What is this really saying to you and I? While we outwardly uphold what the law requires in front of man and think we are hiding before God, we secretly harbor jealously, hatred, malice, and the likes in our hearts. Don’t misunderstand, it is not always that obvious to see in ourselves or others. Sometimes, it’s as simple as the way we speak into someone’s life, or how we hold others to a standard we can not maintain ourselves. Now we are strapping a yoke on others that is opposite of the one Jesus has offered in His Word, “my yoke is easy and my burden is light”. Why? Is it because secretly we want them to fail, or are we jealous of the zeal and passion we see in someone we wished we possessed? Or, maybe what we are really afraid of the potential you see in others to advance the Kingdom of God leaving us covered the dust of the wrong Rabbi? Worse still, the love we have is only operating inwardly toward self; and not outwardly towards others reflecting the love of our SAVIOUR? In Luke chapter 12 The crowds were gathering by the masses and were growing to the point men were trampling over one another to see Jesus perform miracles, signs and wonders. However, Jesus’ focus was not on the mass of people, instead turning to the disciples he warns them of hypocrisy. In the masses were the Pharisees, and they came to see Jesus “PERFORM” miracles and judge his acts to be sure he did not break the law of Moses. Perhaps even the disciples, if being honest, would admit they were excited to see the masses of people approaching because it would bring attention to them as well. In that day a disciple of Jesus would have had to leave their families, abandon their trades, or give up family professions to follow Jesus. So did the thought pass through their minds, at least for a moment, make them turn in toward self and take their heart and focus off their call? These are questions I do not have the answers to, but I do believe I am required to check myself for daily. You see this story isn’t far off for me, in fact it is crouching at my doorstep. I am left with a decision. I must decide this day if I will humble myself before God, and allow Him to expose within my own prideful heart. Then even bigger still will I humble myself even further to repent. Or will I remain stubborn and foolish by shoving it down deeper inside, until when it finally does come out it spews onto others as it sweeps them deeper into the depths of despair like a millstone dragging them to the bottom of the ocean? Putting ourselves first, even before the will of God is a place of exaltation. It is the very reason Lucifer was cast down from Heaven. He became self-aware of his own beauty and abilities. Self awareness can ultimately lead to pride; and pride ultimately to death in every aspect of our life. REASON 3: Sin of any kind, if left unchecked, leaves the soil of our heart unable to produce growth; and will eventually leave us spiritually dead making us useless to the lost world that we are supposed to be a light to. The salt has lost it salitness! I believe this makes JESUS WEEP!! Here’s the hope! Jesus teaches the disciples simple and practical truths to keep them from falling prey to the sins of hypocrisy. Therefore, you and I can take to heart. Together let’s humble ourselves before the Lord, as we apply these 4 principles in our lives as we teach others the hidden dangers of hypocrisy in the life of God’s children. Jesus teaches us to think of others more highly than yourself because it keeps are heart in an attitude of service to others instead of a serve me attitude. Watch for people, places or things that make you the center of attention without acknowledging the ONE who is worthy of the work He does inside of you to bring HIM glory. If you have to hide it, it is not from GOD. Everything will be exposed one day and you will never be able to hide even a single word from God. Be the man or woman of God you were called to be and take to Him first, and REPENT. We must always be accountable to God FIRST without exception. Do not be a people pleaser or you will never please the heart of GOD. Man can not help you on the day of judgement nor can man give you eternal life. However when we care more about the world we become aware of our own life. Placing importance on our physical life may open us up to fear and will ultimately cause you to move away from your faith. Talk with God all day everyday. Find time to devote to prayer and reading God’s Word daily. The more you know God’s heart the less likely you will loss your heart to hypocrisy. The Holy Spirit did not come to just live inside you, but also to convict the world. Hypocrisy mask the presence of God in the believer and blinds the eyes of the unbeliever to the love of Christ living inside you. REMEMBER GOD NEVER STOPS PURSUING US! Comforting thought huh? Jesus is saying the real danger for His people is not failing, but hypocrisy, We all fail; or will fall at some point and that’s ok with Him. He will never let you fall without being there to reach down and pick you up over and over. To always encourage through another day, and love you without condemnation. One reason is because it is repels the lost and pushes them away from a more intimate relationship with Him. We need to have intimacy with the Holy Spirit at all times and in all circumstances. We need to be allowed to show the world that in spite of our limitations, weakness, and failures, we have hope, joy, love, and peace in our Lord Jesus which this world can not offer. When we stand in the face adversity and tribulation, we understand it is not by our own might, but by the Spirit of God. Then the world will see the light of God’s people and the Jesus in us. That’s our most important Testimony of all, and if it’s not it really should be! Lord, I pray you will expose the hidden sin in my heart. Help me to be real and transparent as I examine my heart in truth before you. I confess those things that would take root in my heart that would produce hypocrisy and cause me to rebel against YOU Oh Lord. I ask that you help me to NEVER be a repellant of the good news of Jesus Christ. Lead me away from the darkness and into the light of Your presence. Let every hidden thing be revealed and every evil deed uncovered. We give You honor, glory and praise for the miraculous works of you hands in our lives. We will trust the work in us and in our hearts have begone by our faith in Your Word. Thank you for dying so we may live. Thank you for interceding for us continuously and without fail. God you created us in Your image and set us into creation to demonstrate your love and light to others. You are the Author and Finisher of our faith. Therefore, we lay this at your feet believing you will trade our sacrifice of ashes for Your Beauty. Let my body, mind, and soul glorify YOU in all I do from this day forward. We ask this in the mighty name of JESUS. May We Bless you, OH LORD! How Do You See God In HEAVEN??? HOW DO YOU SEE GOD IN HEAVEN? How we relate to God personally in prayer, determines our perspective and how we approach a HOLY GOD! Often times when we pray, our vision of God resembles the image you see here. In essence, Jesus was saying, if you have seen me, then you have seen God. If you know me, then you know God. Jesus was God manifested upon the earth in human form. He had all the power of God, yet because of his love for us; he willingly chose to lay aside His deity, and be born a man. Is it possible this was God’s plan from the beginning? God created Adam in His image and placed him in paradise. However, in one single act of disobedience, Adam released sin into the world. Where once Adam would walk in the cool of day to commune with God, he now would run away from God and hide his face. In order to reconcile His children into a right relationship again, God sent His only Son into a world full of sin to conquer death and deliver redemption to the entire world. Hence, restoring our ability to, once again commune with our Father in Heaven. Therefore, In order for prayer and communication with God not to become boring or just another legalistic practice; we must approach God differently. Yes, with reverence and holy fear, but with the revelation that Jesus’ Blood bought and paid for atonement of all sin, and all who receive him, God will receive unto HIMSELF. Jesus did what we could not do, in order that we may draw near to a God and walk intimately with HIM in the cool of the day. To be afraid, or intimated, by the very one who made it possible to approach HIS throne in boldness, would be to deny the work of Jesus Himself. Do not be the blinded as the Pharisee, or the pagans who did not acknowledge HIM at all. Why stand at arms distance, when our Savior has made clear a path where a HOLY God waits to be a loving Father, if only we would ask. and we must always acknowledge HIS sovereignty and holiness. Also, He should be feared (reverenced), but we should not be afraid of HIM (hide away in terror). His word says, “fear is the beginning of wisdom”, and one glance of HIS glory would bring death. God’s power works for us, not against us. It is meant for judgement, and holy anger toward the evil coming against HIS kingdom, not his children! That’s the God in HIM, not the FATHER in him, which guards, protects, and provides for his children. If you”re struggling with your perception of God, then let me encourage to get in your quiet place and allow God to show your HIMSELF!!!!! Take at look at the functions the Godhead provides above. Where might we identify a breakdown in the function of our earthly supporters? Write down three (3) attributes for each support role in your own life here on earth. Then ask God to reveal any areas of potential danger for forming wrong viewpoints of HIM. Most importantly how to move towards restoring those relationships in forgiveness, release, or restoration. Be willing to lay it ALL down on the altar of God, so the enemy has no more power over you. The truth is, people are not perfect and they will fail you, and miserably sometime, we are fallible and live in a fallible world. God’s plan is perfect, he is infallible and uses his resources to set all things right. He will use the good, bad and the ugly! Nothing will be wasted, not even the pain will go unused. He uses it all to bring a kingdom of darkness to its knees, in HIS timing. He will wipe away the filth of the world with the tears shed you thought He had forgotten, as Jesus places a crown of honor upon head, created specifically for you. Father, we ask You to come into our hearts and release freedom to approach You as a Father who loves us. Expose the lies we’ve believed about Your nature that does not line up with Your Word, and reveal the truth! Create in us a clean heart Oh Lord, and examine our motives. Where fear wells up, pour out love and bestow mercy to us. Give strength to persevere, and protect our heart in the midst of evildoers. Where we have once stood in the outer courts of Your temple to praise, draw us closer to You for worship and intimacy. Today we are willing!! If Your nature and love for us too great for our understanding, then why do You command us to seek you as hidden treasure. Break down the walls that divide and hide us from YOU. Let our faith arise; and our unbelief fall away, as we trust you Father! Today, let’s us be willing to see what we have allowed to remain hidden due to shame, disappointment, or pain by the hands of others. We open our hands and give it up to YOU! And, for those who have already entered by Your grace, then may a burning desire grow within them to reach down and grab the hand of others who may be crying out for help. Every move we make should be in surrender. We should never take a step outside complete surrender to JESUS! It would be impossible for us to ever carry out God’s will in our lives, let alone in the world, if we do not see what HE sees first! We do not see as the world sees and soon forgets, we will not forget who YOU are and what You done for us! We adore YOU OH LORD, guide our every steps today as you overtake our hearts! I pray for those who long to really know and believe upon YOU. Help us to see through Your eyes before we lift our words to YOU. Each day we struggle to know what You want for our lives. Yet You make it simple, it is man who complicates You due to a lack of knowledge. Oh Lord, let us hear for ourselves what YOU would say to us. I proclaim over those who dare to find YOU, to open Your Word and let Your Spirit come alive inside their hearts. Heaven is a reality, however, most of your children arise and pass it by because they do not see it! Oh God, help us to walk and speak with power as Jesus did. He only did what he saw YOU do, and he only said what he heard YOU speak. Then Jesus only prayed, as YOU prayed through HIM! So let our words be few before YOU as we speak with great boldness and all confidence, YOUR WORD at all times! In order that we not be subject to the world, but rather, the world would be subject to us, by the words flowing from the lips of Your children empowered by Your Spirit. Lord, give us the courage to believe we can FOLLOW YOU in all things! So we extend love to our enemies and pray for those who have persecuted us in this life. We pray for those who have offended us and give forgiveness as YOU have forgiven us. Let us not be like the world who sees and soon forget, but rather, like the Sons and Daughters of God. For if we do not point this world to YOU, then where shall they go in their times of trouble? Lead us out today, and we will be sure to give YOU all the honor and glory for it all. Hello, I would like to begin with this disclaimer: First of all, I am not a pastor, a theologian, or even a woman of prominent influence in my community. I am just someone with a heart for God and a passion for prayer that exceeds mere words. Communication with my Creator is a place of refuge and intimacy that has not only shaped my life, but has profoundly affected every area of my existence. To whom much is given, much is required, and I have been given more than one deserves by a God who chose to die for me while I was yet a sinner full of sin and rebellion. My only wish is to share the blessings God has graciously poured out over my life during my quest to not only find HIM, but be close enough to physically hear the beating of HIS heart. My story of redemption has many layers that run long and deep. At some point in our time together you will get to know me, my family, and my testimony a bit better. It is certainly one which demonstrates the miraculous hand of God and His power to restore, redeem, and transform lives, families, and destinies. However, this blog is not about me or even about my journey that led to finding the greatest treasure in my life. But rather, it is about the heart of our FATHER and getting to know Him through prayer. Not just any prayer, but intimate conversations with God that are true, fulfilling, and transforming. You see, often times we come into prayer with our own agendas, when all along God just wants to commune with us. Why does God spend so much time pursuing us? Even the angels in heaven have ask their Creator that very question. By faith, I am stepping out to blog the prayers He lies on my heart, and I am inviting you to join me. My prayer is that you have the desire to develop a real connection through our conversations with God. I will post prayers I feel God has laid on my heart for this season, words of exhortation, and blessing prayers for people as God allows. Also, it is very important before you decide to partner in prayer; or post prayers request on this blog to pray. Ask the Lord to reveal His purpose for you through this experience. Our focus needs to always be on Him and grounded in His Word without exception. It has been said, “a good leader has many followers”, but I say, “a great leader teaches others to follow Jesus.” As God builds you up, and grows your desire to walk more closely with HIM in prayer and intimacy, you will begin to trust HIM and believe HE can and will answer your prayers! In John 11:35 – Jesus wept not because he was saddened at the death of his friend Lazarus, in fact, it was the contrary. Jesus was informed by the disciples several days before his arrival to the tomb of his friend, yet he was not moved by tears until he beheld Mary’s state as she drew near. It was then Jesus welled up with compassion and was deeply troubled. WHY? For those who should have known him best, were the very ones who did not believe on HIM as the giver of life. They knew him and were followers of Christ, yet they did not believe he possessed the power to raise a body long proclaimed dead. I am passionately and intimately inviting you to come into relationship with HIM through prayer. Not to change the mind of God, but for HIM to change you into the image of Jesus. Until we really know God, we tend to pray from the only perspective we know… earth toward Heaven. Believe me, this is a daunting task, however, as The Holy Spirit transforms us through intimacy with God, we begin to see things much different. 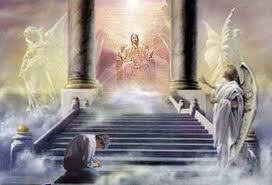 Now with a mind like Christ, we supernaturally begin to pray Heaven toward earth. Knowing with assurance nothing is too big in your life, and no circumstance reaches too far for the arm of God, changes your relationship with HIM. Thereby increasing our faith to extend beyond knowing, but believing nothing in this world is out of His control. To acknowledge anything less, is simply because you do not recognize HIM for who HE really is! If you are willing to fast your unbelief as we spend time alone with God, your life will never be the same as you witness yourself God’s desire to not only hear your prayers, but answer and provide your every need. If only you dare to ask!! !